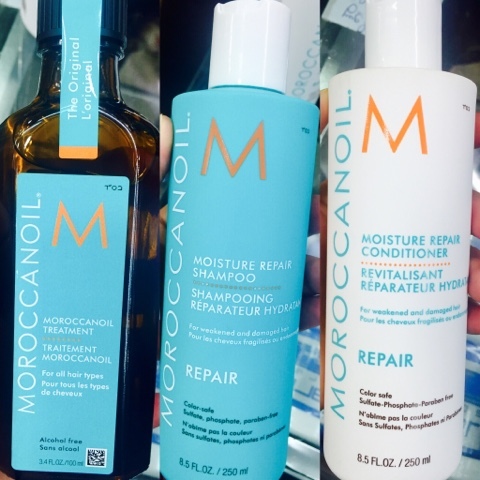 Hope you all are doing great, Todays post is about the magical products from the Moroccanoil Magnifique range. Its a luxury treatment that gives amazingly great results. I was suffering from major hair fall due to a lot of fluctuations in sugar level so I had to go for a product that would actually help me get back the volume of my hair. I've been using these products for more than a month now and almost got them over but i'll definitely repurchase them. It repairs damage and boosts shine, softness and strength and now my hair feels so amazing and look amazing too. So lets get in to it in detail how it works. I have long dry hair. So I needed a shampoo that would moisturize and clean at the same time. I wash my hair twice or thrice a week. The difference of my hair after shampooing using this shampoo and conditioner versus the kind I usually use. Even after using the curling iron, I was amazed as how my hair even curled better and held that curl longer. 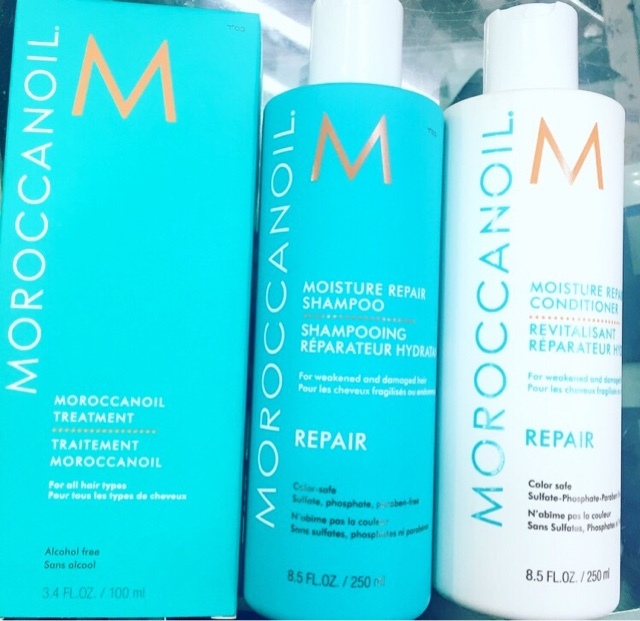 Moisture Repair Shampoo and Conditioner are for hair that has been weakened or damaged by color, chemical processing or heat styling. They restore hair by bathing it in a highly concentrated formula rich in antioxidant argan oil, reconstructive keratin and fatty acids. Both products restore elasticity, moisture and manageability. The formulas are free of sulfates, phosphates and parabens, so they're safer for the environment and won't dry, fade or strip color-treated hair. Washed my hair with this product and my hair did feel like straw right after the shampoo rinsed out of my hair. But it felt very clean, like cleaner than my hair has felt in a while. The moment I put the conditioner on, my hair felt like silk. To the point where I almost couldn't tell when the conditioner fully rinsed from my hair because my hair was just so silky. But my super favorite product is the oil. I like it so much that I've already got one more in advance so that I have a backup if it runs out of stock ;p I love, love, love the oil, But I have to say all of these products are my new favorites!!. Talking more about the oil, Moroccanoil Treatment Light's versatile, nourishing and residue-free formula can be used as a conditioning, styling and finishing tool. It blends perfectly with other products and even speeds up drying time. This treatment for hair completely transforms and repairs as its formula transports lost proteins for strength, fatty acids, omega-3 oils, vitamins for shine and antioxidants for protection. It absorbs instantly to fill gaps in hair created by heat, styling and environmental damage. The BEST stuff I have ever used...my hair looks and feels GREAT!!!! I will never buy anything else it is worth every penny you spend!!! You must try it to understand.Now I just need the Moroccan Oil Intense Hydrating Mask which is out of stock most of the time but i'll make sure i get it and also put a review on how it works. Overall I am really impress on the softness of my hair. I recommend all of it. If you guys are not sure whether the products will suit or not than you can visit any Jean-Claude Biguine Salon and Spa and get this treatment done for approx 4000 where in your hair will be treated to its best treatment infused with Anti-oxidant rich argan oil.Its one of my favorite French Salon, this is how I came to know about these magical hair products. 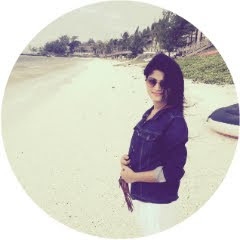 Hope you find it meaningful and useful, Thank you for stopping by and reading it, Keep visiting.